Health	RegiMEn Testosterone Support Review: Is it a scam? L-lysine is an essential amino acid, or protein building block that our body cannot make on its own. Most people know of l-lysine as an effective treatment for cold sores, but it can benefit us in many more ways. You have to get l-lysine from your diet since the body doesn’t make it on its own, which you can do from food or through supplements as well. 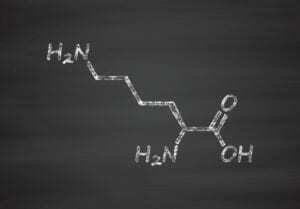 What Is the Amino Acid L-Lysine? L-lysine is an amino acid, which our body uses to make proteins. These proteins are no just used to make our muscles as what comes to mind for most people, but play roles in every functions that our body performs on a cellular level. This essential amino acid is one most people use to fight cold sores, and is effective in doing so because it is used by the body to create collagen. Collagen is what the body uses to repair and maintain connective tissue, like our skin. Another way in which lysine is believed to fight against cold sores and the herpes virus is believed to be linked in its role with another amino acid called arginine. Arginine is involved with the replication of the herpes virus, and high levels of lysine decrease the levels of arginine which decreases replication. What Are the Benefits to L-Lysine? L-lysine provides us with more benefits than the ability to fight off cold sores. L-lysine may help to reduce anxiety and relieve stress as well. This is because L-lysine can help the body better absorb calcium in the body, and calcium is used by our cells in signal signaling which controls many processes in the body. Calcium deficiency is a huge problem especially in aging women as it can lead to osteoporosis. L-lysine shouldn’t just be a concern for those people looking to boost their immune system. Another benefit to L-lysine is that it can act similarly like serotonin, binding to a serotonin receptor an an antagonist. What this all means is that l-lysine can help balance mood as well. L-lysine is also used in the maintenance and growth of skeletal muscle tissue as well, so make sure you are getting enough l-lysine from your diet, or take a supplement to make sure you are getting at least your daily recommended value. What Are the Foods Highest In L-Lysine? Just one 3 oz serving of either beef or lamb will give you more than all the lysine you need for the day and then some. Both beef and lamb will give you about 130% of your daily of value of lysine, slightly more or less depending on the cut of meat. Cheese in general is a good source of l-lysine but parmesan is the best of the bunch. 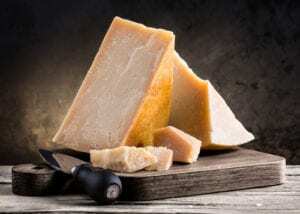 One ounce of parmesan cheese will give you about 44% of the recommended daily allowance of lysine, while romano and gruyere are other great options as well. This might seem low compared to beef and lamb, but remember that one serving of cheese here is only 1 ounce, compared to a 3 ounce serving. Poultry especially chicken and turkey are also great sources of lysine. The wing specifically has the most lysine per gram, and will give you 125% of your daily recommended value; but the breast and drumsticks are both great sources as well. A 3 ounce serving of any of the three will give you enough l-lysine for the day. 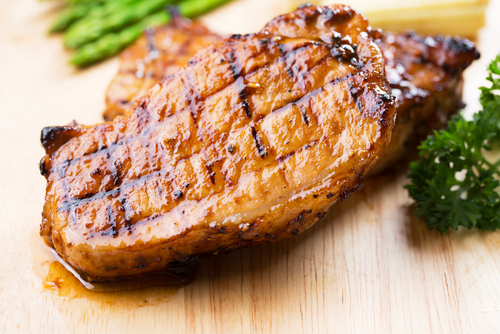 Pork can be a great source of lysine as well, if you want to be the most health conscious go with the pork chop because of its lower fat content. If you don’t want to give up the bacon that’s fine, as it is loaded with plenty of lysine at 140% of your daily value in one serving. If you are a vegan, or mainly eat plant based foods, your best option is soy. A cup of roasted soy beans will give you about 11%% of your recommended daily value of lysine. Other forms of soy have lysine as well, but don’t have as nearly as much per serving as does roasted soybeans. If you are a vegan and want your lysine to come from more than just soy, seeds like pumpkin, chia and sunflower seeds are good options. Cashew nuts and pistachio nuts are good sources also.